This post was first published on Oct 14th 2013 by “Manchester Policy Blogs“. 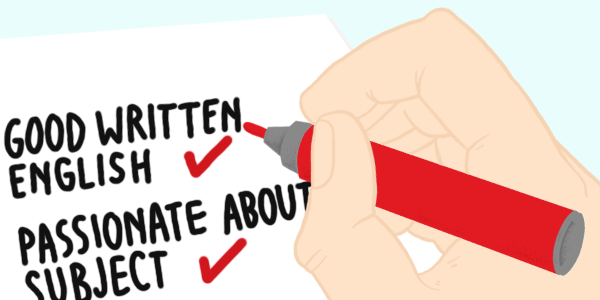 With the first UCAS deadline of the academic year looming, thousands of University hopefuls are putting the finishing touches to their personal statements. But growing evidence points towards the current process favouring some applicants more than others – and it may be time for a radical overhaul, according to Dr Steve Jones. “The UCAS personal statement is academically irrelevant and biased against poorer students,” ran the headline of one Telegraph blog last month. According to its author, paying a private company to write your statement now costs between £100 and £200, and the whole thing is little more than “an exercise in spin”. Meanwhile, The Times report that tutors “often ignore students’ personal statements,” describing the indicator as “worthless”. The debate has interested me since I was commissioned by the Sutton Trust last year to collect new evidence about the personal statement. My findings were stark. Basic writing errors (like misspelling and apostrophe misuse) were three times more common among applicants from state schools and sixth form colleges as those from independent schools. There were also big differences when it came to work experience: independent school applicants had lots more, and it tended to be high prestige. All of the statements I looked at were written by students with the same A-level results, so I wondered whether the textual differences offered a partial explanation for the unfair outcomes reported in UK admissions processes more broadly. For example, research at Durham University has shown that state school applicants are only 60% as likely to be made an offer by Russell Group universities as independent school applicants with the same grades in “facilitating” subjects. This was the response of Cambridge University’s Prof. Mary Beard to my research, and I think it’s a very reasonable point. Any experienced reader of statements will have well-honed “crap detection” skills. Who’s to say our admissions tutors aren’t seeing right through the fancy work placements and LAMDA successes? The problem is, as a sector, we’re neither consistent nor transparent in how personal statements are read. Sometimes they’re given close, critical attention; sometimes not. Either way, we keep schtum about the criteria we use and the weight we attach to them. This point was made to me twice by a BBC TV newscaster. The answer is no, there’s never an excuse. However, if you have lots of people to proofread your statement and you’re repeatedly told it’s something you’ve got to get right, chances are you’ll take a bit more care. The sixth form college applicant who made twelve basic language errors in his statement wasn’t stupid – his attainment record proves that – he just didn’t understand how much those mistakes could count against him. It’s never easy to argue with the word ‘holistic‘, but there’s no advantage to using lots of indicators unless every one is bringing fairness to the selection process. Perhaps a small amount of appropriately contextualized attainment evidence is actually more equitable than a wide range of hazy non-academic indicators? The Oxbridge colleges sometimes use this argument, but it isn’t a very strong one because most UK university applicants aren’t interviewed for any of the degree programmes to which they apply. And, for those that are, surely it’s not beyond interview panels to formulate their own questions? Besides, the most elite universities are often the sniffiest about statements: we don’t want “second-rate historians who happen to play the flute,” says Oxford’s head of admissions; “no tutor believes [the personal statement] to be the sole work of the applicant any more,” says his former counterpart at Cambridge. This point is made regularly, but with half a million statements written every year, maybe it’s time someone mentioned it to the young people who stress and sweat over writing them? There’s room for compromise, of course. 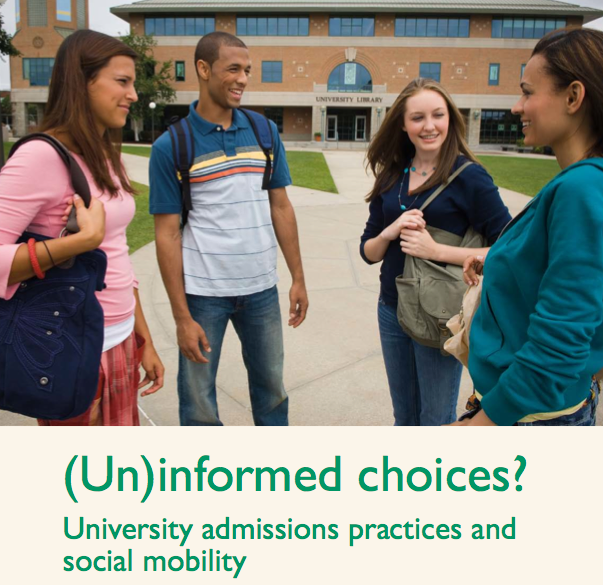 In 2004, the Schwartz Report suggested redesigning the UCAS application form to include prompts that elicit more directly relevant information in a more concise fashion. Those applicants with the social and cultural capital to secure the best work experience and highest prestige extra-curricular experience would then have less opportunity to cash in on their good fortune. This entry was posted in Admissions, Attainment, Participation, Pearson, Personal Statement, Sutton Trust, UCAS and tagged Admissions, participation, Pearson, Schooling, Widening Participation. Bookmark the permalink.